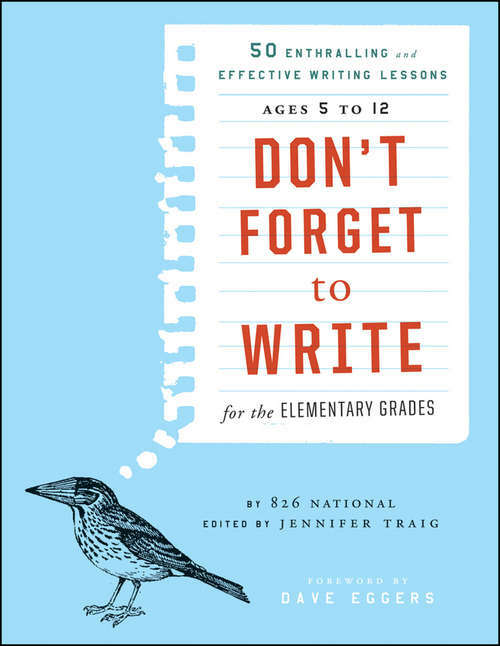 Creative strategies for getting young students excited about writing Don't Forget to Write for the Elementary Grades offers 50 creative writing lesson plans from the imaginative and highly acclaimed 826 National writing labs. Created as a resource to reach all students (even those most resistant to creative writing), the lessons range from goofy fun (like "The Other Toy Story: Make Your Toys Come to Life") to practical, from sports to science, music to mysteries. These lessons are written by experts, and favorite novelists, actors, and other celebrities pitched in too. Lessons are linked to the Common Core State Standards. A treasure trove of proven, field-tested lessons to teach writing skills Inventive and unique lessons will appeal to even the most difficult-to-reach students 826 National has locations in eight cities: San Francisco, New York, Los Angeles, Ann Arbor, Chicago, Seattle, Boston, and Washington DC 826 National is a nonprofit organization, founded by Dave Eggers, and committed to supporting teachers, publishing student work, and offering services for English language learners.